Four players lead as Xiong lost to Robson in round four. | Photo: Lennart Ootes/Saint Louis Chess Club. 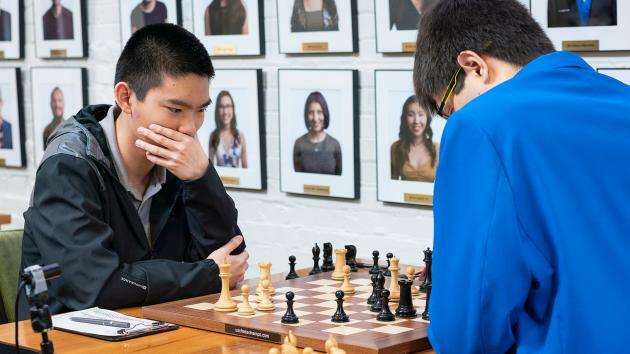 After four rounds the 2019 U.S. championship has four leaders, all on plus one: Jeffery Xiong, Wesley So, Hikaru Nakamura and Leinier Dominguez. Jennifer Yu leads the women's tournament after winning all four games. Xiong went from shared first to sole leader back to back to sharing that first place again. In round three he took down the reigning champion in a remarkable game that started with a sideline in the Scotch. "I was very nervous at first; it looks like a very strong novelty," Xiong said about Shankland's very interesting 8.Kf2 move. "Suddenly the king is quite safe there." However, the very next move by Shankland looked "weird" to Xiong, who felt his opponent might have mixed up his preparation. "Instinctively" he then sac'ed a pawn for an attack. Xiong: "There has to be something there, otherwise... chess is just not fair!" The attack was strong indeed, but even though he didn't execute it perfectly, Xiong did manage to win in the end. Round three in action. | Photo: Lennart Ootes/Saint Louis Chess Club. Last year Nakamura didn't win a game until round 10, but now it came as early as the third round. It was a game that one of the commentators in St. Louis must have appreciated. "It was a very Yasser game," the winner said. "Yasser likes smooth, positional victories, no tactics, no nonsense!" He did point out a moment where his opponent could have drawn, which needed some calculation for which Sam Sevian didn't have time on the clock. Nakamura and Sevian signing each other's score sheets. | Photo: Lennart Ootes/Saint Louis Chess Club. In his first U.S. Championship, Dominguez scored his first win, from the black side of an Anti-Berlin vs Ray Robson. At first it seemed we would get to see an attack from both flanks, but then the queens got traded. Black was already comfortable there, and slowly outplayed his opponent. Robson and Dominguez, about to start their game. | Photo: Lennart Ootes/Saint Louis Chess Club. That meant that Xiong was leading the pack with 2.5/3, ahead of Nakamura, So and Dominguez who were on 2/3. That group of players are now all sharing the lead, because on Saturday Xiong was the loser of the only decisive game, against Robson. "He caught me off-guard in the opening and I didn't react well at all," admitted Xiong. "I was down maybe close to an hour [on the clock - PD] with a terrible position. By a stroke of luck I was able to come back somehow (...) but in time pressure I made some more bad moves." Robson was content with his 13...Qa5 move, which was probably the moment where Xiong got surprised. Black was soon better, but indeed more adventures followed. Ray Robson interviewed by Maurice Ashley. | Photo: Lennart Ootes/Saint Louis Chess Club. Before we move on to the women's tournament, one remarkable fact needs to be mentioned. Timur Gareyev is known for his eccentric "play" on and off the board, and once again he surprises with a remarkable act. As it turns out, he has decided to play in another tournament during the U.S. Championship! Gareyev now also plays the Mid-America Open, about 20 minutes drive away from the Saint Louis Chess Club. He won his first game there, before drawing with Sevian in round four. Amazing. As you can see on the clock, Gareyev arrived 25 minutes late. It turned out he had already played a game of chess... | Photo: Lennart Ootes/Saint Louis Chess Club. GM Robert Hess is bringing live commentary each day. There's still one player in contention for the special Bobby Fischer prize. The 11th world champion famously won all his games in the 1963/1964 championship, and if anyone will be able to repeat that, he or she will get a nice financial bonus from Mr Sinquefield. Jennifer Yu won't be thinking about that yet, but going 4/4 is a wonderful start in any case. A big one was her black win over Irina Krush in round three. The game seemed to be going well for Krush, who got a pawn majority on the queenside that seemed menacing. Yu wasn't worried, though, an expected something to happen on the kingside at some point: "I didn't see anything directly winning on the queenside." The game seemed promising for Krush at the start. | Photo: Lennart Ootes/Saint Louis Chess Club. Krush kept doing well, but her exchange sacrifice on move 29, played quickly, was over-optimistic. "She played it really fast but I didn't really get it. It gave me a lot of momentum," said Yu, who finally got her attack, which was just overwhelming with the white queen away from the action. After the game it became clear that 29.Rc5 was probably an emotional move, because Krush felt that "blundering" the h4-pawn earlier was the critical moment. Sadly for her, that was not even a blunder so she got upset about something that was't even a mistake. She stated that she was going "game by game," and Yu then also won her next one. This was an easier effort, themed around the f5-square. Jennifer Yu (middle), still on a perfect score. | Photo: Lennart Ootes/Saint Louis Chess Club. The official broadcast of round four.